This article shows how complex these problems are, and how our thinking has changed after developing several vehicle concepts. The combined populations of India and China are in the order of 2.5 billion people. The rise in average incomes and the growth of a new middle class in these countries means that there will be 300 million entering the middle class in the next decade. Our assumption was that these people will want the mobility options that the current middle class enjoys. However, the growing mega-cities (such as New Delhi, Beijing, Mumbai, Shanghai) all have major pollution issues. We initially thought that a low cost sustainable vehicle was necessary, at entry level for the new middle class, or as a small second / run-around vehicle for the current middle class. Our solution was a small lightweight vehicle for such a sector: Zero Emission, USD$7,000 retail, Simple construction; named the Model-T2 as it was designed for the 21st Century Ford Model-T global design competition (below). Our design philosophy was “Integrated Simplicity” – integrating common functions into single systems. This idea was influenced by Henry Ford who pioneered design for manufacture, integrating functionality in single components, and using the latest material solutions (at that time – high strength steel out of Europe). 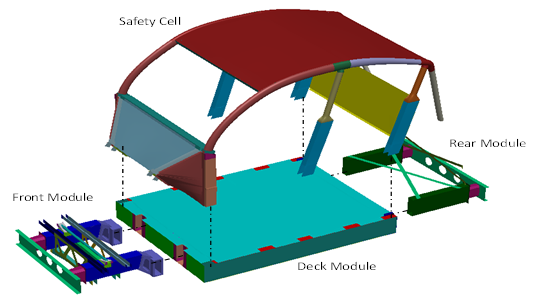 Our clean sheet approach enabled us to view the vehicle in a different way, and we separated the vehicle into a series of functional systems (propulsion, supporting structure, ride and handling, styling, and human/machine interface) - see diagrams below. We could then group some functional systems together to achieve better integrated solutions. Ride and handling and propulsion were combined to simplify the steering mechanism. Individually controlled hub motors on the front wheels enable steering without a heavy rack and pinion system, enabling more storage space as well as decreasing the number of manufactured parts. The hub motors used compressed air as the “fuel”, making it a zero-emission vehicle. Supporting structure and propulsion were combined to integrate the (compressed air) fuel tank with the rolling chassis. 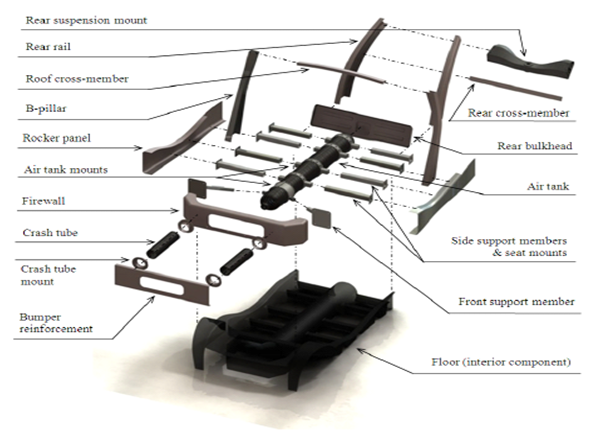 This increased the stiffness of the chassis, while again reducing the number of manufactured parts and the weight of the vehicle. Another key integration was to combine the supporting structure and the styling. The supporting structure enabled mounting points that allowed the main styling canopy to be changed easily to quickly change the look/purpose of the vehicle. Our design also used material innovation, where parts were made from ultra-high strength steel (martensitic steel) as well as a range of fibre-reinforced composites, with a final kerb weight of just under 400kgs. 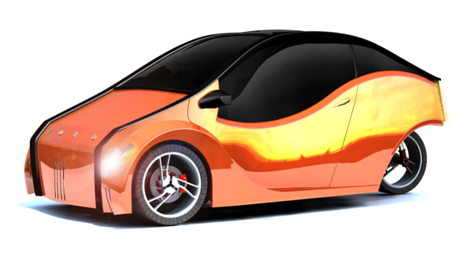 Since 2008, when we developed our Model-T2 low cost-sustainable vehicle concept, we have not seen much advancement on low cost sustainable vehicles, perhaps the Mahindra e2o is the exception. On-going discussions with Prof John Duncan have revealed to us that, while some of the technical thinking may have been innovative, perhaps a deeper thinking was necessary with regard to the economics of our ideas. The second social challenge facing the automotive world is the wealth needed to underpin a sustainable automotive industry. The rise of the middle class in India and China, has also seen a large increase in the urbanisation of these countries. This has seen wealth redistributed from the regions to the cities. The highly urbanised areas (including Western nations) have seen a decreasing desire for individuals to buy their own cars, because of the additional costs from ownership in large crowded cities. Furthermore, individual ownership is decreasing because of the additional transport options available through Uber/Lyft, and the driverless fleets that are about to disrupt the market. 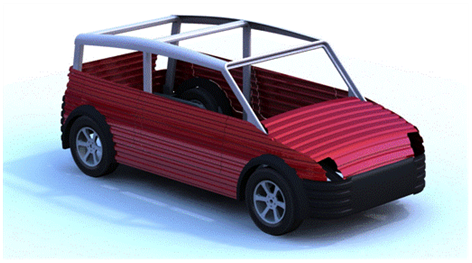 Thus, a low-cost sustainable vehicle is not desired, and perhaps, not even necessary! Developing nations and the regions, on the other hand, need to generate enough of their own wealth to purchase vehicles. This is where we at Deakin needed to modify our thinking from cheap sustainable vehicles to affordable, sustainable vehicles. What does affordable mean? Affordability is where people in the local economy have the wealth (and the desire) to purchase the mobility solutions that their economy can provide. Thus, a developing region will need to identify two things: first, the desired type of sustainable vehicle for the region; second, the manufacturing system that can provide that vehicle. One such solution to this problem is for the economic activity to be centred in widely distributed automotive builders/dealers. They could assemble vehicles suitable for the local consumers and would demand their assembly parts from local manufacturers. The design concept for these types of vehicles would need to be simple to produce and assemble locally, while providing value to the consumer. The distributed manufacturing system would need to identify the smallest volume necessary to be economically viable at the builder, parts and the material supplier levels. 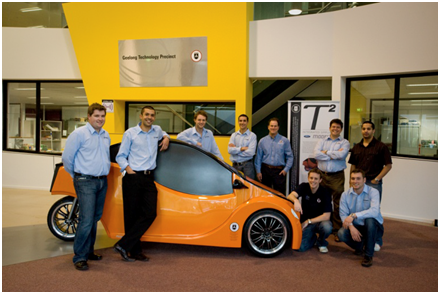 One such concept that we devised was a roll formed vehicle illustrated below. The aim was to provide a rugged, practical vehicle for the local consumer. The concept was for a utility-type vehicle, similar to a Citroen 2CV, where the vehicle was capable of transporting produce and people. The roll forming process is not a new technology - it has been around for over 100 years. However, it has the capability of forming materials with very low ductility. It can also be set-up locally, because it has low tooling and material costs. The skill in roll forming is the manufacturing know-how, enabling wealth for the individual manufacturer. This concept vehicle could be simply assembled at a dealer. The next step for this concept is to design a viable distributed manufacturing system. 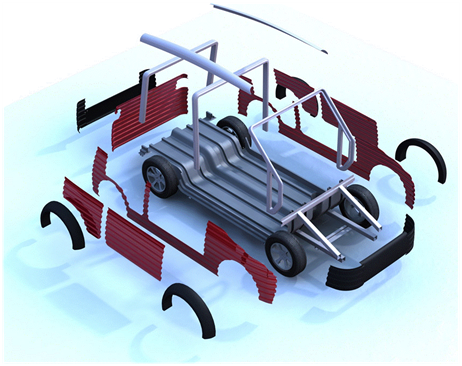 Another concept we developed was the Lightweight Modular Vehicle Platform, funded by Excellerate Australia – and five other research institutes (Deakin, RMIT, Swinburne, ANU, VPAC), which was a radical body structure that was powertrain independent. It aimed to compartmentalise functionality to specific modules of the body structure, while making the overall production affordable in small volumes. Continuous production processes, such as roll forming and pultrusion, were chosen, while simplicity in design was paramount (see diagrams below). Our first belief was that cheap sustainable vehicles were necessary for the new middle class; however, they appear not to be what people desire. Thus, an affordable, sustainable vehicle with distributed manufacturing systems appears to be the way forward. This will enable more individuals to gain wealth through a local automotive industry (in developing regions) and to purchase their own sustainable mobility solutions. We hope that these ideas will spark new concepts that will solve our future social challenges and benefit all. A/Prof Bernard Rolfe is from Deakin University in Australia, where he is the Lightweighting theme leader for the Australia wide Cooperative Research Centre for Automotive Technology (now known as Excellerate Australia). Dr Tim de Souza is a Design and Engineering Specialist at Quickstep Automotive (Chief Design Engineer on the Model-T2 project). Emeritus Prof John Duncan is from the University of Auckland, where he was awarded the Geoff Wilson Medal from Deakin University, for his long-term support of innovative manufacturing.